President Trump is going to face resistance from Sen. John McCain (R-Ariz.) if he repeals sanctions on Russia, as is reportedly "under consideration" by his administration. 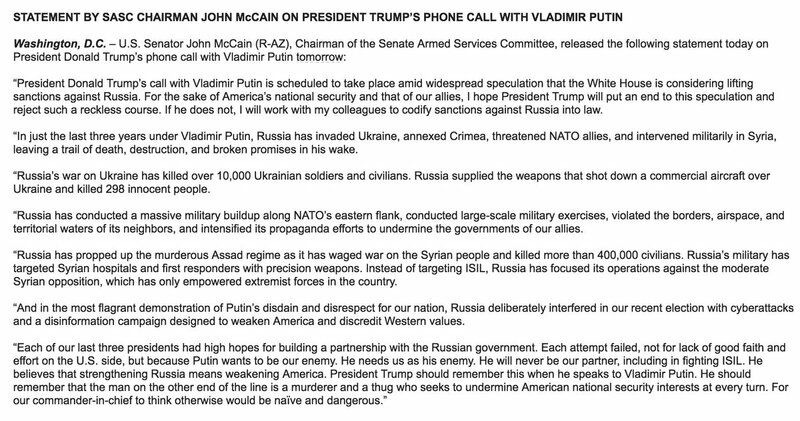 In a statement released the day before Trump's phone call Saturday with Russian President Vladimir Putin, McCain urged Trump to "put an end to this speculation and reject such a reckless course." "If he does not, I will work with my colleagues to codify sanctions against Russia into law," McCain wrote in the statement. McCain went on to recall Russia's wrongdoings, including its annexation of Crimea, its intervention in Syria, its "massive military buildup along NATO's eastern flank," and its "flagrant demonstration" of "disdain and disrespect" in its cyberattacks ahead of the U.S. presidential election. McCain also reminded Trump the last three U.S. presidents have had "high hopes for building a partnership" with Russia, though each attempt "failed" because "Putin wants to be our enemy." Trump "should remember that the man on the other end of the line is a murderer and thug who seeks to undermine American national security interests at every turn," McCain said. "For our commander-in-chief to think otherwise would be naïve and dangerous."